Hi girls, I came out of the shop with the best herbal products in India called Himalaya range of products, I will review one by one all are awesome and love them all. 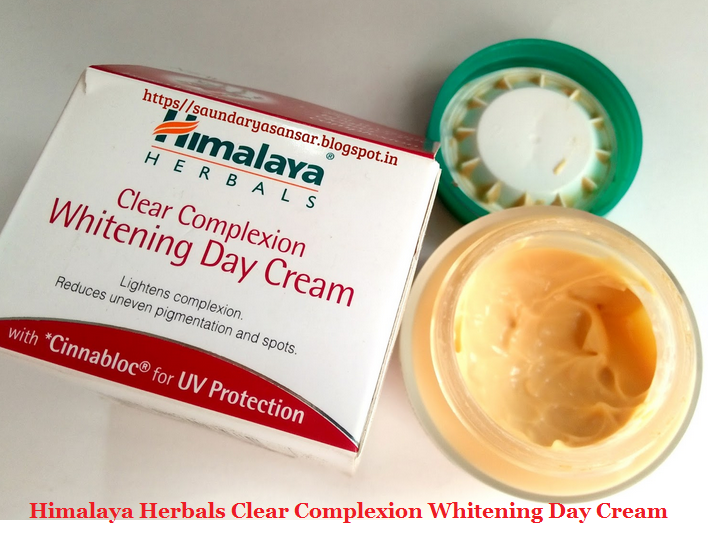 Himalaya does what it claims, so never miss to get use from that excellent ranges, now coming to the whitening cream, it can be applied beneath the foundation, it is non-greasy and light to carry. It has excellent aroma and beautiful creamy texture that will glide on your skin. So let’s see how this product worked for me. Aqua,CaprylicCapric Triglyceride, Isopropyl Myristate, Glycerin,Cetearyl Alcohol, Cetyl Alcohol, CetearylEthylhexanoate, GlycerylStearate[SE], RicinusCommunis Seed Oil and Hydrogenated Castor Oil, Sorbitan Stearate & Sucrose Cocoate, Titanium Dioxide, Phenoxyethanol, Sodium Cetearyl, Sulphate, Fragrance, Sodium Benzoate, Carbomer, GlycyrrhizaGlabra Root Extract, HedychiumSpicatum Extract, AlpiniaGalangaRhizome Extract, Ethylhexylglycerin, VateriaIndica Bark Extract, Disodium EDTA, Tocopheryl Acetate, Sodium Hydroxide, BombaxMalabaricum Flower Extract, Methylisothiazolinone, Rheum Emodi Root Extract, Cl 14700. Licorice is known to lighten skin, and fade dark spots and blemishes, to give your skin a brighter complexion by inhibiting melanin synthesis. White dammer exhibits antioxidants properties to help reduce mild pigmentation and spots, resulting in even skin tone. Himalaya herbals clear complexion whitening day cream gives you a radiant glow and brighter skin tone. This light, non-greasy day cream is enriched with unique herbal extracts and cinnabloc to provide three effective actions. CLEAR COMPLEXION- Evens skin tone. The breakthrough herbal sunblock Cinnabloc provides UV Protection and prevents skin darkening. Cleanse your face and hands. Dot face and neck with Himalaya herbals clear complexion whitening day cream. Massage using a circular Motion. It also acts as a great base for makeup. I like this product so much, it does what it claims but in little bit only. Otherwise it act as a good sun protection cream also we don’t want to apply sun screen beneath the foundation and day cream, it act as an multipurpose cream like we don’t want to buy fairness cream, moisturizer cream and sunscreen cream separately, it has the three variants within itself, so one cream with all the purpose is beneficial for us. Comes in an adorable, beautiful glass jar it makes us to use the cream again and again and also that fragrance is unbeatable. Overall if you use this product regularly means it will make wonders on your skin. Doesn’t produce any skin damages. Act as a sun protection also. No parabens, sulphate and alcohol. Makes a good base for makeup too. Easily available with affordable price. Glass tub is not travel friendly. Some may find bit costly. WILL I REPURCHASE – Yes, I will definitely repurchase it because it doesn’t produce any skin damages to my skin.